The Papua New Guinea women's national cricket team represents the country of Papua New Guinea in international women's cricket. The team is organised by Cricket PNG, an associate member of the International Cricket Council (ICC). 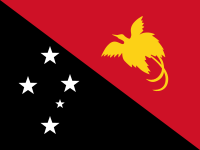 Papua New Guinea made its international debut in September 2006, playing a three-match series against Japan to determine which team would represent the ICC East Asia-Pacific (EAP) region at the 2008 World Cup Qualifier. Papua New Guinea won the series against Japan three–nil, but at the World Cup Qualifier won only two matches, both against Bermuda. The team failed to qualify for either the 2011 World Cup Qualifier or the 2013 World Twenty20 Qualifier, with Japan representing the EAP region on both occasions. At the 2015 Pacific Games, which Papua New Guinea hosted, a women's cricket event was included for the first time. The team narrowly lost to Samoa in the final, having been undefeated up to that point. Later in the year, Papua New Guinea participated at its second global tournament, the 2015 World Twenty20 Qualifier, placing fifth out of eight teams. In April 2018, the ICC granted full Women's Twenty20 International (WT20I) status to all its members. Therefore, all Twenty20 matches played between Papua New Guinea women and another international side after 1 July 2018 will be a full WT20I. The team played its first WT20I match against Bangladesh on 7 July 2018 at VRA Cricket Ground, Amstelveen in Netherlands in the 2018 ICC Women's World Twenty20 Qualifier. Statistics are correct as of Papua New Guinea v Scotland at Utrecht, July 14, 2018. ^ "WT20I matches - Team records". ESPNcricinfo. ^ "WT20I matches - 2019 Team records". ESPNcricinfo. ^ a b Other women's matches played by Papua New Guinea women – CricketArchive. Retrieved 26 November 2015. ^ Women's List A matches played by Papua New Guinea women – CricketArchive. Retrieved 26 November 2015. ^ a b Women's Twenty20 matches played by Papua New Guinea women – CricketArchive. Retrieved 26 November 2015. ^ "All T20I matches to get international status". International Cricket Council. Retrieved 26 April 2018. ^ "ICC announces umpire and referee appointments for ICC Women's World Twenty20 Qualifier 2018". International Cricket Council. Retrieved 27 June 2018. ^ "Records / PNG Women / Women's Twenty20 Internationals / Highest totals". ESPN Cricinfo. Retrieved 14 June 2018. ^ "Records / PNG Women / Women's Twenty20 Internationals / Lowest totals". ESPN Cricinfo. Retrieved 14 June 2018. ^ "Records / PNG Women / Women's Twenty20 Internationals / High Scores". ESPN Cricinfo. Retrieved 14 June 2018. ^ "Records / PNG Women / Women's Twenty20 Internationals / Best Bowling figures". ESPN Cricinfo. Retrieved 14 June 2018. This page was last edited on 1 February 2019, at 17:50 (UTC).